ASME is excited to participate in National Nanotechnology Day an event sponsored by the National Nanotechnology Coordination Office, which provides technical and administrative support to the Nanoscale Science, Engineering, and Technology (NSET) Subcommittee, serves as a central point of contact for Federal nanotechnology R&D activities, and provides public outreach on behalf of the National Nanotechnology Initiative. This event will feature a series of community-led events and activities on or around October 9th to help to raise awareness of nanotechnology, how it is currently used in products that enrich our daily lives, and the challenges and opportunities it holds for the future. This date, 10/9, pays homage to the nanometer scale, 10-9 meters. ASME has focused on Nanotechnology research and activities for many years. In 2001, the Nanotechnology Institute (NI) was formed to further the art, science and practice of nanotechnology by acting as a clearinghouse/focal point for ASME. Over time, the Institute focused on devising interdisciplinary activities that bridge science, engineering, and applications. Such activities included the first-ever interdisciplinary track on Nanotechnology at ASME’s IMECE in 2001 and the one-day co-produced Nano Engineering and Investing Trends conference offered in June 2002, which served as a segue to the premier Integrated Nanosystems 2002 conference. In recent years, ASME’s strategic interest in Nano has been focused on Nano engineering for medicine and biology. You can find the promised materials here. National Nanotechnology Day will feature a series of community-led events and activities on or around October 9th to help to raise awareness of nanotechnology, how it is currently used in products that enrich our daily lives, and the challenges and opportunities it holds for the future. This date, 10/9, pays homage to the nanometer scale, 10-9 meters. There isn’t much additional information about events but hopefully more will pop up soon. This entry was posted in nanotechnology, public engagement and tagged 100 Billion Nanometer Dash, American Society of Mechanical Engineers (ASME), Nano Nuggets, NNCO, NNI, US National Nanotechnology Coordination Office, US National Nanotechnology Day, US National Nanotechnology Day 2016, US National Nanotechnology Initiative on October 3, 2016 by Maryse de la Giroday. 2016 EnvisioNano image contest winner announced! The National Nanotechnology Coordination Office (NNCO) is pleased to announce the winners of the latest round of EnvisioNano, a nanotechnology image contest for students. Ben Davis and Ryan Hines, members of the Maschmann Lab at the University of Missouri, won for their image Graphene Shows its Stripes. They work on innovative methods to machine nanomaterials like graphene in order to capitalize on the transformative properties of these materials. Congratulations to Ben and Ryan! Images posted online for public voting received more than 2,000 votes. The top three images advanced to the semifinalist round. The final winner was chosen by representatives of the National Nanotechnology Initiative (NNI) member agencies. The winning image will be displayed on Nano.gov for a month. For more information on the EnvisioNano contest rules and judging, visit the EnvisioNano page. I have written previously about EnvisioNano (a June 7, 2016 post which included an invitation to vote; and an April 4, 2016 post about the US NNI’s 2017 budget supplement [scroll down about 50% of the way for the information about the EnvisioNano 2015 contest images on its cover]). This entry was posted in nanotechnology, public engagement and tagged Ben Davis, EnvisioNano, Graphene Shows its Stripes, NNCO, NNI, Ryan Hines, University of Missouri, US National Nanotechnology Coordination Office, US National Nanotechnology Initiative on July 7, 2016 by Maryse de la Giroday. Cumulatively totaling nearly $24 billion since the inception of the NNI in 2001, the President’s 2017 Budget supports nanoscale science, engineering, and technology R&D at 11 agencies. Another 9 agencies have nanotechnology-related mission interests or regulatory responsibilities. Throughout its two terms, the Obama Administration has maintained strong fiscal support for the NNI and has implemented new programs and activities to engage the broader nanotechnology community to support the NNI’s vision that the ability to understand and control matter at the nanoscale will lead to new innovations that will improve our quality of life and benefit society. This Budget Supplement documents progress of these participating agencies in addressing the goals and objectives of the NNI. It also serves as the Annual Report for the NNI called for under the provisions of the 21st Century Nanotechnology Research and Development Act of 2003 (Public Law 108-153, 15 USC §7501). The report also addresses the requirement for Department of Defense reporting on its nanotechnology investments, per 10 USC §2358. For additional details and to view the full document, visit www.nano.gov/2017BudgetSupplement. I don’t seem to have posted about the 2016 NNI budget allotment but 2017’s $1.4B represents a drop of $100M since 2015’s $1.5 allotment. Each year’s National Nanotechnology Initiative Supplement to the President’s Budget features cover images illustrating recent developments in nanotechnology stemming from NNI activities that have the potential to make major contributions to National priorities. The text below explains the significance of each of the featured images on this year’s cover. Front cover featured images (above): Images illustrating three novel nanomedicine applications. Center: microneedle array for glucose-responsive insulin delivery imaged using fluorescence microscopy. This “smart insulin patch” is based on painless microneedles loaded with hypoxia-sensitive vesicles ~100 nm in diameter that release insulin in response to high glucose levels. Dr. Zhen Gu and colleagues at the University of North Carolina (UNC) at Chapel Hill and North Carolina State University have demonstrated that this patch effectively regulates the blood glucose of type 1 diabetic mice with faster response than current pH-sensitive formulations. The inset image on the lower right shows the structure of the nanovesicles; each microneedle contains more than 100 million of these vesicles. The research was supported by the American Diabetes Association, the State of North Carolina, the National Institutes of Health (NIH), and the National Science Foundation (NSF). Left: colorized rendering of a candidate universal flu vaccine nanoparticle. The vaccine molecule, developed at the NIH Vaccine Research Center, displays only the conserved part of the viral spike and stimulates the production of antibodies to fight against the ever-changing flu virus. The vaccine is engineered from a ~13 nm ferritin core (blue) combined with a 7 nm influenza antigen (green). Image credit: NIH National Institute of Allergy and Infectious Diseases (NIAID). Right: colorized scanning electron micrograph of Ebola virus particles on an infected VERO E6 cell. Blue represents individual Ebola virus particles. The image was produced by John Bernbaum and Jiro Wada at NIAID. When the Ebola outbreak struck in 2014, the Food and Drug Administration authorized emergency use of lateral flow immunoassays for Ebola detection that use gold nanoparticles for visual interpretation of the tests. 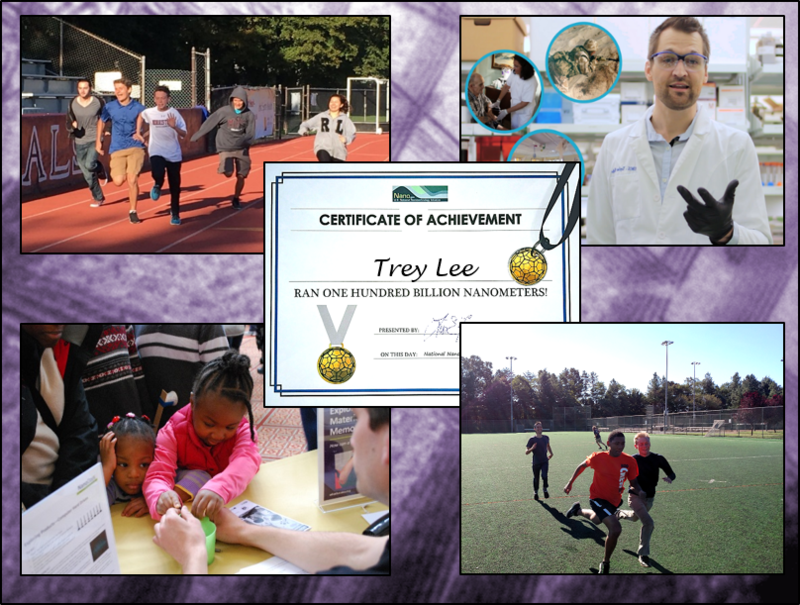 Back cover featured images (above): Images illustrating examples of NNI educational outreach activities. Center: Comic from the NSF/NNI competition Generation Nano: Small Science Superheroes. Illustration by Amina Khan, NSF. Left of Center: Polymer Nanocone Array (biomimetic of antimicrobial insect surface) by Kyle Nowlin, UNC-Greensboro, winner from the first cycle of the NNI’s student image contest, EnvisioNano. Right of Center: Gelatin Nanoparticles in Brain (nasal delivery of stroke medication to the brain) by Elizabeth Sawicki, University of Illinois at Urbana-Champaign, winner from the second cycle of EnvisioNano. Outside right: still photo from the video Chlorination-less (water treatment method using reusable nanodiamond powder) by Abelardo Colon and Jennifer Gill, University of Puerto Rico at Rio Piedras, the winning video from the NNI’s Student Video Contest. Outside left: Society of Emerging NanoTechnologies (SENT) student group at the University of Central Florida, one of the initial nodes in the developing U.S. Nano and Emerging Technologies Student Network; photo by Alexis Vilaboy. This entry was posted in nanotechnology, science communication, science funding and tagged Abelardo Colon, Alexis Vilaboy, Amina Khan, Elizabeth Sawicki, EnvisioNano, FDA, Generation Nano: Small Science Superheroes, Jennifer Gill, Nanotechnology-Inspired Grand Challenge (for future computing), Nanotechnology-Inspired Grand Challenges, NNCO, NNI, NNI’s Student Video Contest, North Carolina State University (NCSU), NSF, OSTP, PCAST, Society of Emerging NanoTechnologies (SENT), U.S. Nano and Emerging Technologies Student Network, University of Central Florida, University of Illinois at Urbana-Champaign, University of North Carolina (UNC) at Chapel Hill, University of Puerto Rico at Rio Piedras, US federal 2017 buget, US Food and Drug Administration, US National Nanotechnology, US National Nanotechnology Coordination Office, US National Science Foundation, US NIH National Institute of Allergy and Infectious Diseases (NIAID), US NIH Vaccine Research Center, US President’s Council of Advisors for Science and Technology, US White House Office of Science and Technology Policy (OSTP), Zhen Gu on April 4, 2016 by Maryse de la Giroday. It’s always interesting to contrast two approaches to the same issue, in this case, innovation and education strategies designed to improve the economies of the United States and of British Columbia, a province in Canada. One of the major differences regarding education in the US and in Canada is that the Canadian federal government, unlike the US federal government, has no jurisdiction over the matter. Education is strictly a provincial responsibility. While many in the tech sector will be focused on the short-term benefits of a quick injection of large capital [a $100M BC Tech Fund as part of a new strategy was announced in Dec. 2015 but details about the new #BCTECH Strategy were not shared until Jan. 18, 2016], the long-term benefits for the local tech sector are being seeded in local schools. More than 600,000 BC students will be getting basic skills in the K-12 curriculum, with coding academies, more work experience electives and partnerships between high school and post-secondary institutions. … the government wants to embed computer coding into the education system for K-12 (kindergarten to grade 12). One determined reporter (Canadian Press if memory serves) attempted to find out how much this would cost. No answer was forthcoming although there were many words expended. Whether this failure was due to ignorance (disturbing!) or a reluctance to share (also disturbing!) was impossible to tell. Another reporter (Georgia Straight) asked about equipment (coding can be taught with pen and paper but hardware is better). … Getting back to the reporter’s question, no answer was forthcoming although the speaker was loquacious. Aside from the BC government’s failure to provide details, I am uncomfortable with what I see as an overemphasis on computer coding that suggests a narrow focus on what constitutes a science and technology strategy for education. I find the US approach closer to what I favour although I may be biased since they are building their strategy around nanotechnology education. The Administration’s updated Strategy for American Innovation, released in October 2015, identifies nanotechnology as one of the emerging “general-purpose technologies”—a technology that, like the steam engine, electricity, and the Internet, will have a pervasive impact on our economy and our society, with the ability to create entirely new industries, create jobs, and increase productivity. To reap these benefits, we must train our Nation’s students for these high-tech jobs of the future. Fortunately, the multidisciplinary nature of nanotechnology and the unique and fascinating phenomena that occur at the nanoscale mean that nanotechnology is a perfect topic to inspire students to pursue careers in science, technology, engineering, and mathematics (STEM). The Generation Nano: Small Science, Superheroes contest [mentioned in my Nov. 24, 2015 posting], hosted by the NSF [US National Science Foundaton] and the NNI, challenges high school students to design nanotechnology-enabled gear for an original superhero. This contest has garnered the support of none other than Stan Lee, the co-creator of such legendary Marvel comic book characters as Spider-Man, Iron Man, the Fantastic Four, and the X-Men! Submissions are due February 2, 2016; consult the contest web site for details. NNCO [National Nanotechnology Coordination Office] and the National Institute of Standards and Technology collaborated with Fairfax County Public Schools in Virginia to develop the middle school video series Innovation Workshop: Nanotechnology, which was recently distributed nationwide. Students at Western Carolina University, with guidance from the NNCO, have created educational animations about nanotechnology [mentioned in my Jan. 21, 2016 posting] that are featured on Science Matters, Community Idea Stations. These videos and animations are also available through Nano.gov. NNCO is expanding the teacher resources on Nano.gov and working with nanoHUB to develop a searchable database for nanoeducation. This portal addresses a critical challenge identified at the NSF Nanoscale Science and Engineering Education (NSEE) Workshop: the difficulty educators face in finding appropriate lesson plans, laboratories, and other resources for teaching nanoscience and engineering in their classrooms. NNCO is coordinating a growing, national Nano & Emerging Technologies Student Network. The network consists of student-run clubs at colleges and universities across the country that are focused on raising awareness of current and potential applications of emerging technologies, as well as promoting opportunities for student research and internships. The network will convene for the first time this summer at the TechConnect World Innovation Conference & Expo at the National Harbor in Maryland. The President’s Computer Science for All Initiative seeks to provide $4 billion in funding for states and an additional $100 million directly to school districts in a push to provide access to computer science training in K-12 public schools. The money would go toward things like training teachers, providing instructional materials, and getting kids involved in computer science early in elementary and middle school. $135 million in Computer Science funding to become available starting this year from the National Science Foundation (NSF) and the Corporation for National And Community Service (CNCS). Nothing says one approach has to be better than the other as there’s usually more than one way to accomplish a set of goals. As well, it’s unfair to expect a provincial government to emulate the federal government of a larger country with more money to spend. I just wish the BC government (a) had shared details such as the budget allotment for their initiative and (b) would hint at a more imaginative, long range view of STEM education. To bring nanoscience closer to pupils, educational researchers of the University of Tartu decided to implement the European Union LLP Comenius project “Quantum Spin-Off – connecting schools with high-tech research and entrepreneurship”. The objective of the project is to build a kind of a bridge: at one end, pupils can familiarise themselves with modern science, and at the other, experience its application opportunities at high-tech enterprises. “We also wish to inspire these young people to choose a specialisation related to science and technology in the future,” added Lukk [Maarika Lukk, Coordinator of the project]. This entry was posted in science policy, sscience education and tagged [US] Computer Science for All Initiative, #BCTECH Strategy, Barack Obama, BC, BC Tech Fund, Belgium, British Columbia, Canada, Christy Clark, Estonia, European Union, European Union LLP Comenius project, Generation Nano: Small Science Superheroes contest, Greece, Innovation Workshop: Nanotechnology, Jessica Hullinger, Jonathon Narvey, Lisa Friedersdorf, Lloyd Whitman, Maarika Lukk, Megan Smith, nanoHUB, Nanotechnology: Super Small Science series, NIST, NNCO, NNI, NSF, NSF Nanoscale Science and Engineering Education (NSEE) Workshop, Quantum Spin-Off, science technology engineering mathematics, Stan Lee, STEM, Strategy for American Innovation 2015, Switzerland, United States, University of Tartu, US, US Nano & Emerging Technologies Student Network, US National Institute of Standards and Technology, US National Nanotechnology Coordination Office, US National Nanotechnology Initiative, US National Science Foundaton, US White House blog, Western Carolina University on February 1, 2016 by Maryse de la Giroday. This contest is open to students enrolled in US high schools or home-schooled and the deadline is Feb. 2, 2016. A brand-new competition, awarding finalists the opportunity to present their entries at the 2016 USA Science & Engineering Festival [held April 16 & 17, 2016] and compete for cash prizes, opens today for high school students interested in science, engineering and superpowers. Generation Nano: Small Science, Superheroes is sponsored by the National Science Foundation (NSF) and the National Nanotechnology Initiative (NNI). The competition invites individual students enrolled in U.S. high schools, or who are home-schooled, to submit an original idea for a superhero who uses unique nanotechnology-inspired “gear,” such as a vehicle, costume or tool. Generation Nano encourages students to think big–which, in this case, means super small–when pondering their hero’s gear: shoelaces that decode secret radio waves, nanotechnology-infused blood cells that supercharge adrenaline or clothing that can change color to camouflage its wearer. Through nanotechnology applications like targeted drugs, self-assembled nanodevices, molecular motors and other innovations, students never have to endure a radioactive spider bite to realize their full potential. Visit the Generation Nano competition website for full eligibility criteria, entry guidelines, timeline and prize information. The Generation Nano website offers resources for generating comics, accessing images and audio on this page. For inspiration, you can take a look at my May 11, 2012 posting which features a description of the nanotechnology-enabled Extremis storyline in the Iron Man comic book series in the context of plans for the Iron Man 3 movie. For more inspiration from 2012, there was a special exhibit at the Science Gallery in Dublin, Ireland featuring six superheroes created for the exhibit (my Sept. 14, 2012 posting; scroll down about 25% of the way to where I discuss the Magical Materials; Unleash Your Superpowers exhibit). This entry was posted in education, nanotechnology and tagged 2016 USA Science & Engineering Festival, contest, Extremis, Generation Nano: Small Science Superheroes, Ireland, Iron Man, Iron Man 3, Lisa Friedersdorf, Magical Materials; Unleash your Superpowers, Mihail C. Roco. Generation Nano competition, NNCO, NNI, NSF, Science Gallery, US National Nanotechnology Coordination Office, US National Nanotechnology Initiative, US National Science Foundation, US. competition on November 24, 2015 by Maryse de la Giroday.